When I joined Urban Sketchers for my first event with them last June, at Magnusen Park, I became thrilled with the format of our meetings: gather and decide on where to meet afterwards, scatter to go sketch wherever we want, and then, about 2 hours later, rejoin the group to share. This is for me, I thought!! 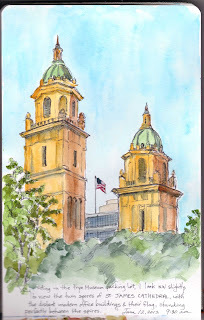 While the concept of Urban Sketching is new to me, I've painted watercolors since my high school years, largely because I grew up in a family of artists. Charles Burchfield is one of America's foremost watercolorists, and I am his grand-daughter! All painting was always done plein air, in Western New York's countryside. When I was a kid and my Mom went out painting, my brothers and I explored the deserted barn she was sketching or played in the fields. Even though I have painted landscapes for the last almost 50 years, it was often a love-hate thing. But about 8-9 years ago as my partner and I traveled around the U.S. in our RV, I began doing "botanicals" with my own twist, because I included journaling and calligraphy. It was the beginning of Nature Journaling for me, and it's definitely something I enjoy doing - a "love" thing, no hate. When I volunteered for 2 years at a retreat center in the remote North Cascades, I created a "portfolio" of fifty 11x14 nature journal pages, mostly in ink and colored pencil. I depicted the seasonally changing birds, flowers, and nature of where I lived. You can view the complete set by going to my flickr site at www.flickr.com/photos/peggyhaug? After a bit more traveling, we returned to Seattle to work (we are both R.N.s) and save for retirement. Enchanted with having a yard in which to garden, plus a normal-sized kitchen (after many years in our RV) plus working full-time, I mentally set aside my art, as I've done in the past when I was raising my children, or taking additional classes at the UW (earning a Bachelors in English with creative writing emphasis.) I didn't even set up my art supplies. But I started exploring the idea of visual journaling (there are many books out on this idea) and somehow in looking at Cathy Johnson's books, I came across Danny Gregory's books as well. Of course, I was noting Gabi Campanero's sketches in the Seattle Times. It mentioned Urban Sketchers, and here I am. One of the best things about joining Urban Sketchers is being able to discover all these unique places IN Seattle! Many I've heard of, but had no compelling reason to visit. Others are complete surprises - a gift! I am really enjoying the challenge of sketching these urban scenes, and it delights me to no end to "see" so many great scenes I WANT to sketch. 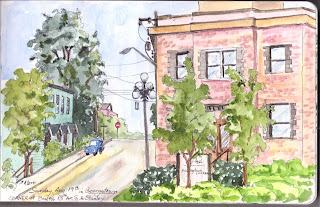 Welcome to Seattle Urban Sketchers, Peggy. Your sketches are lovely. I look forward to seeing more.